I love just putting the ‘usual’ condiments on my burgers. My favorite is mayonnaise. If find that odd since I definitely did not grow up a mayo fan. Sometimes though, I need a little kick to my burger. Since I absolutely love Fire-Eater seasoning, I knew it would find its way into this nice creamy, but a bit spicy, Fire-Eater burger sauce. If you don’t have Sriracha on hand (??? ), then you can certainly substitute your favorite hot sauce, from the mild to the wild. Oh, and yes, this sauce is also fantastic on sandwiches or wraps. And now that I ponder it more, I bet it would be great on grilled chicken wings. I’m gonna try that next! 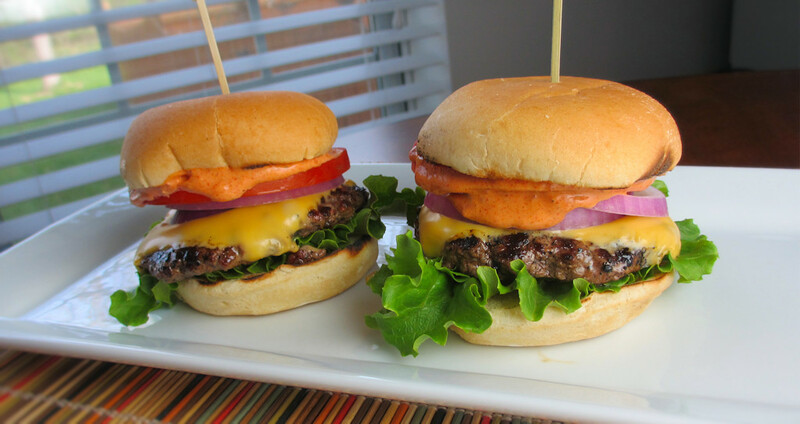 Also check out my version of Nancy’s Special Burger Sauce, copycat Smashburger Sauce, or another one of my seriously spicy favorites, 18000 Island sauce. Baby potatoes have such a wonderful creamy sweetness to them. I love them roasted so the skin gets just a bit crispy. They pop when you bite into them. 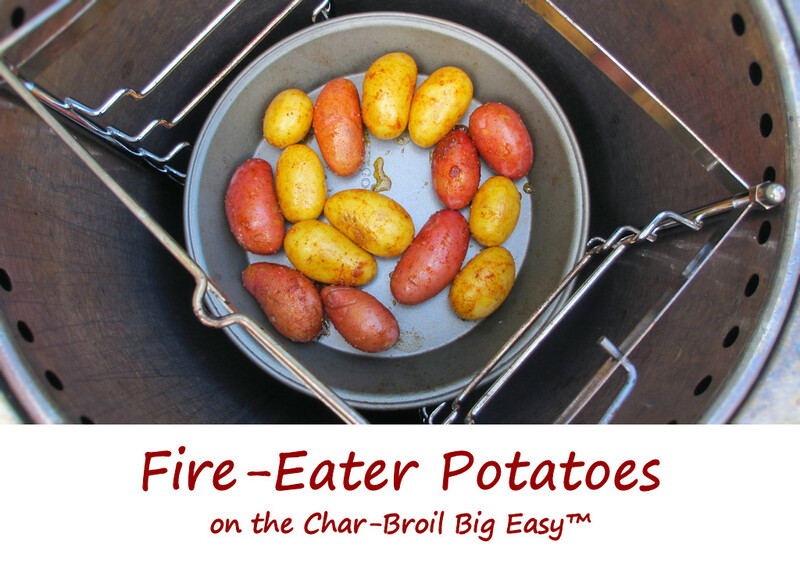 The Char-Broil Big Easy is the perfect cooker for making a lot of things, and these Fire-Eater potatoes are one of them. Roasted potatoes hit with a nice seasoning mix that brings a little heat to offset the sweetness. You can substitute any rub or seasoning mix you desire, but you might want to shy away from any that contain a lot of sugar which might burn in high heat. These Fire-Eater potatoes do cook quickly since they are smaller, but keep an eye on them if you do use a sweeter spice mix. For a little more mellow (but still super yummy!) potato using the Big Easy, try my roasted baby potatoes. You'll need a Big Easy Cooking Rack fitted with 9" pie pans as shown in the picture above, or you can use a Big Easy Bunk Bed basket lined with foil. Drizzle with just enough oil to lightly coat the potatoes. Add the Fire-Eater seasoning and toss to coat. Add potatoes to your Big Easy and lower into the cooker and cook until tender, 15-20 minutes depending on the size. I use a long bamboo skewer to poke the potatoes to test for doneness.